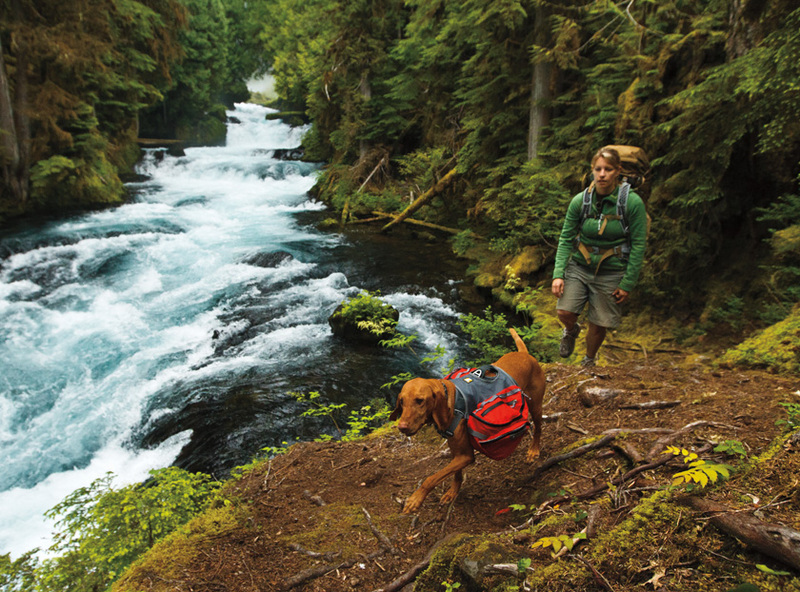 The Palisades Pack makes multi-day backcountry adventures possible with features like removable saddlebags, two collapsible water bottles, and a load compression system. 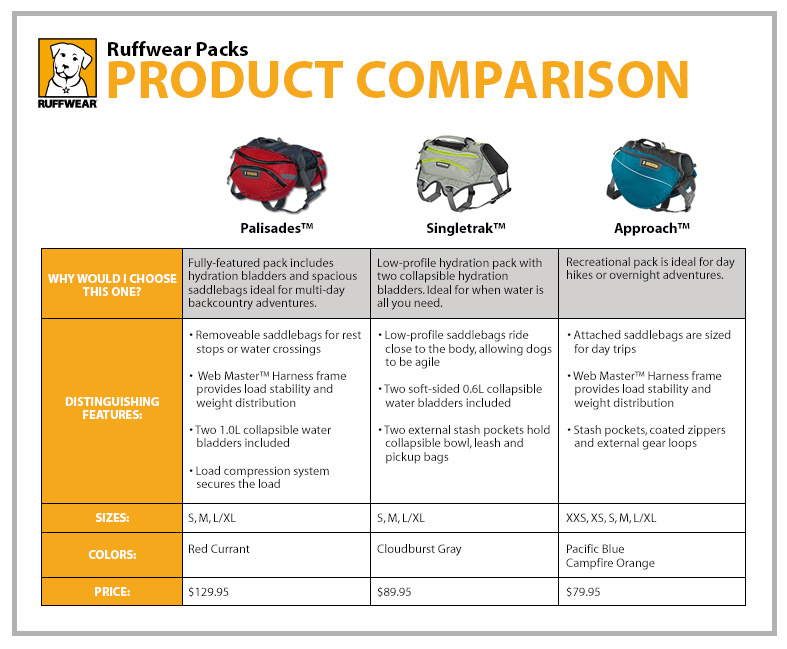 This fully-featured dog pack is built on Ruffwear's Web Master� Harness chassis which ensures load stability and comfortable weight distribution. 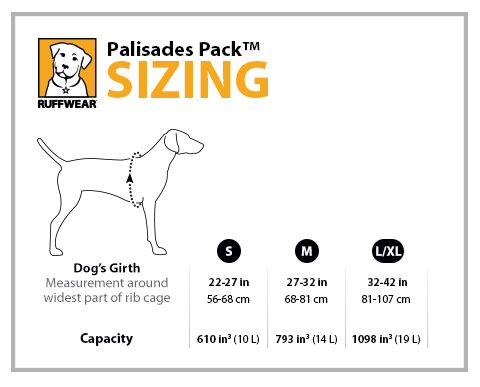 **Please ensure your dog carries no more than 25% of their body weight in their dog pack. "This pack works great for my very active Golden. It stays in place even when he is running around. I really like how the pack detaches from the harness it is very nice to take the pack off to take a rest or to let him take a swim. He is 65 lbs and the medium fits great." 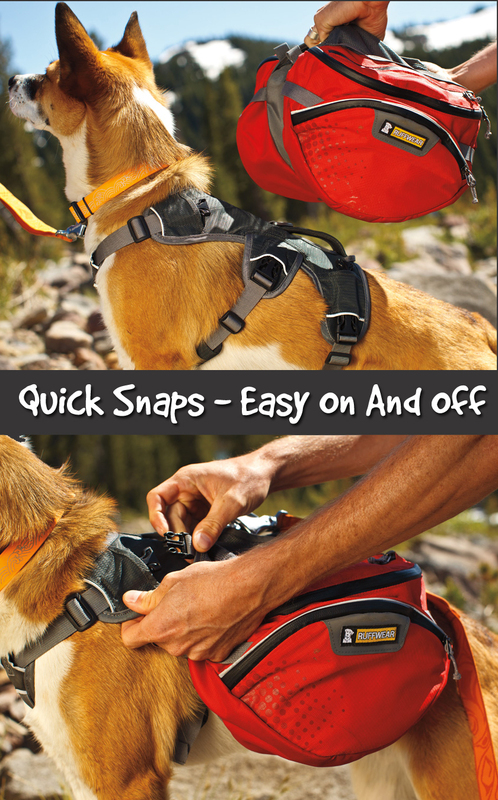 "I'm an amateur outdoors photographer and I got this pack so my dog could help me carry camera gear (bad back). The detachable packs are handy and I make use of all of the pockets. 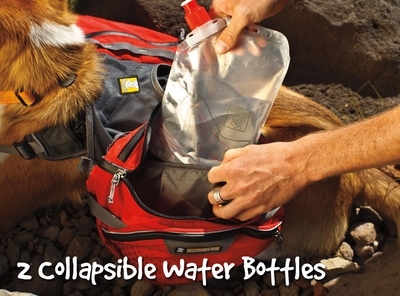 My dog gets hot easily and the hydration pockets are ideal for slipping small ice packs in. My dog loves it because he knows anytime he gets it put on, he's in for an adventure!!" "Excellent dog pack! Quality material, great workmanship, and attention to details. It fits my 7-month Alaskan malamute puppy perfectly, the load balances quite well on her, without the pack shifting to either side. The reflective trim is a nice touch, the ease of removing and attaching the pack to the harness makes it a breeze to take the pack off and give my pup a little rest during breaks. Haven't tried using the water bladders, can probably go with or without it. Would definitely recommend it to all my friends, actually posted some rave reviews of it on the dog forums I frequent." 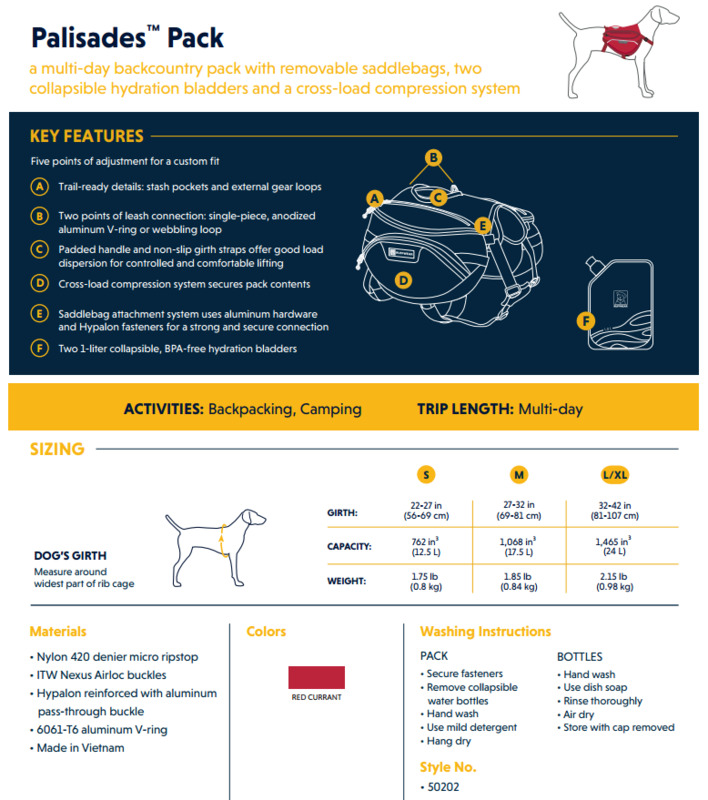 "We use these packs not only for our own dogs, but for our adventure dog walking business. We are very hard on them since up to 8 dogs are pushing and shoving each other around on the trail. They also end up in the ocean or river every now and then on accident, and they stand up to it all really well. 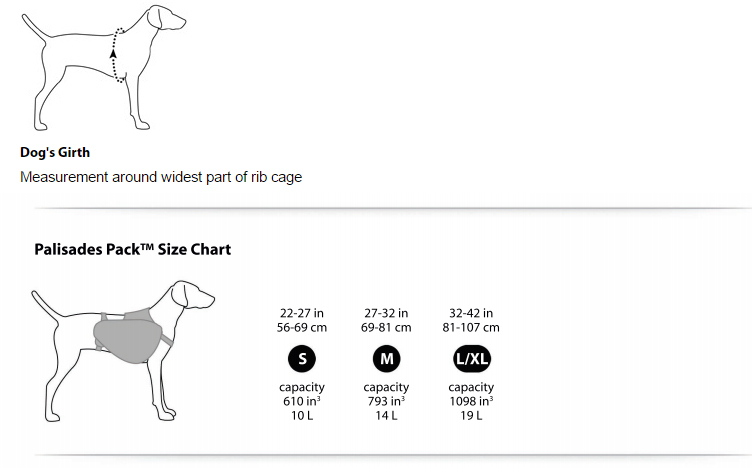 They also fit all the dogs really well with a minimum of movement on the dog as they walk , run or wrestle. We have tried lots of other packs, and these are so much better than all the rest it's almost ridiculous! Buy one, you won't be dissapointed." "It is the first pack that has really fit either of my Newfoundlands well enough to be comfortable. Tinker loves the water bladder & the way it does not slide to one side." "I ordered this pack online and was impressed once I was able to see it first hand, the materials are of good quality along with the stitching. The design is well thought out and the water bladders have been a great benefit for both hydration and comfort for Jesse. The ability to remove the pack from the harness on the go is very practical, and I have done this on several hikes. The harness is easy to fit to my dog and the handle is an excellent feature, allowing me to help my pooch over obstacles. 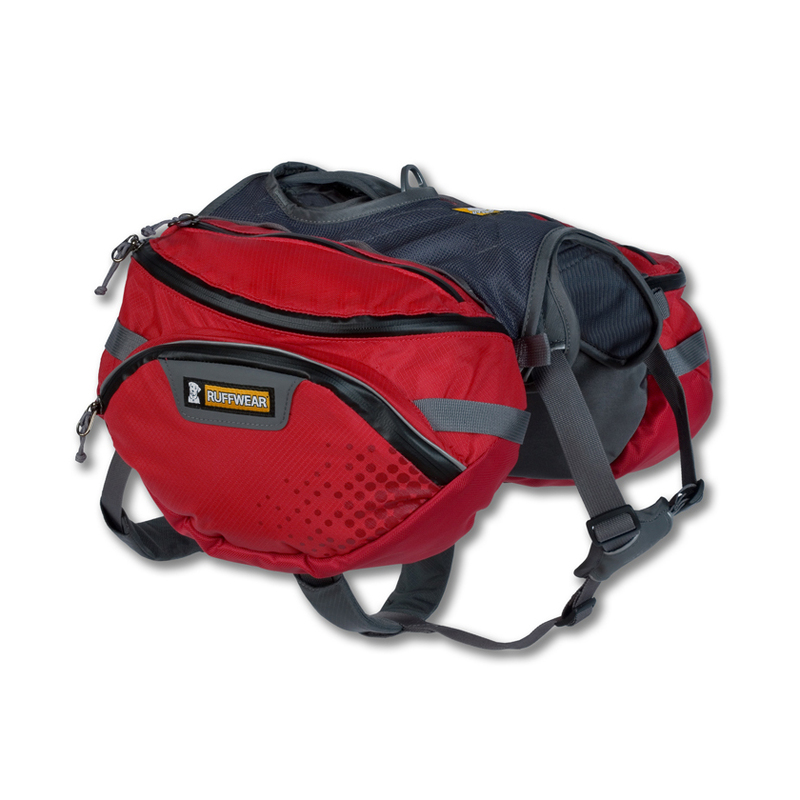 With reflective trim, gear loops, close tight zippers and many more features, this is a TOP quality dog pack. Good job to the designers." "This pack is great, very well thought out. The Dog loves the hydration system as he likes to drink right from the hose. Also there is plenty of space for food and a toy. And the daisy chain works great to strap his sleeping mat on. The pack fits him well and does not seem to irritate him at all. He seems exuberant to wear the pack and gets very excited now when I even touch the pack when I�m around the house thanks for the great product"